Image's Saga Vol. 8 trade paperback, the top graphic novel for December, was both the top reordered softcover for the fourth week in a row and also the top reordered item overall by dollars. 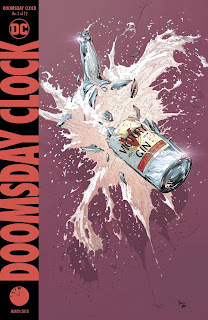 The top reordered comic book for the second week in a row was DC's Doomsday Clock #3, which went on sale January 24. It had previously led the advance reorder charts. The top reordered hardcover was Dark Horse's Hellboy in Hell Library Edition, which came back into stock after its October 11 release. After several weeks with hardcovers and trade paperbacks mostly squeezed out of the list, last week saw a few reenter the list. 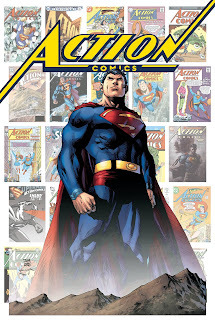 The Action Comics #1000: 80 Years of Superman book was the top item in advance-reorder dollars; it's been first among hardcovers five out of six weeks. It's an April 11 title. The Dark Nights Metal Deluxe Edition was second among hardcovers; it won't be out until June 6. The top advance reordered comic book was Thanos #16 from Marvel, due out on Feb. 28. Returning to the list as the top March-slated comic book was the Oblivion Song by Kirkman and De Felici Collector's Edition. The top trade paperback (after three weeks in which none made the list) was Walking Dead Vol. 29, due out March 7. We've seen enough reorders and advance from the past few weeks from Diamond Comic Distributors to be able to collate some information onto pages for January 2018, February 2018 and March 2018. Check them out for a further glance at the future.